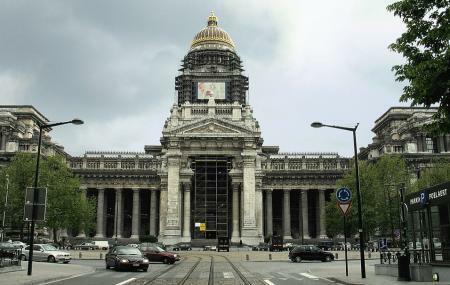 This was the largest building built in the 19th century, is the largest courthouse in the world and also is Brussels’ highest court. The architecture of the huge grey building with the golden dome is eclectic and neoclassical. Over 75 landlords and 3000 family homes were forced to relocate to make space for the Palace, which meant that for a while the word ‘architect’ was actually an insult in Brussels. Luckily for tourists, the building is open to the public, so you can just walk into the lobby, though access to the courtrooms may be somewhat restricted. The interior is highly stylish and dramatic, with magnificent proportions and detailing. Outside the building check out the two war memorials. One for Belgians who perished in WWI and WWII, and the other for the British soldiers who fought in Belgium in WWI. How popular is Palais De Justice? People normally club together Basilique Notre Dame De Bon Secours and Cathedral Of St. Michael And St. Gudula while planning their visit to Palais De Justice. People also prefer to start their day with Palais De Justice.